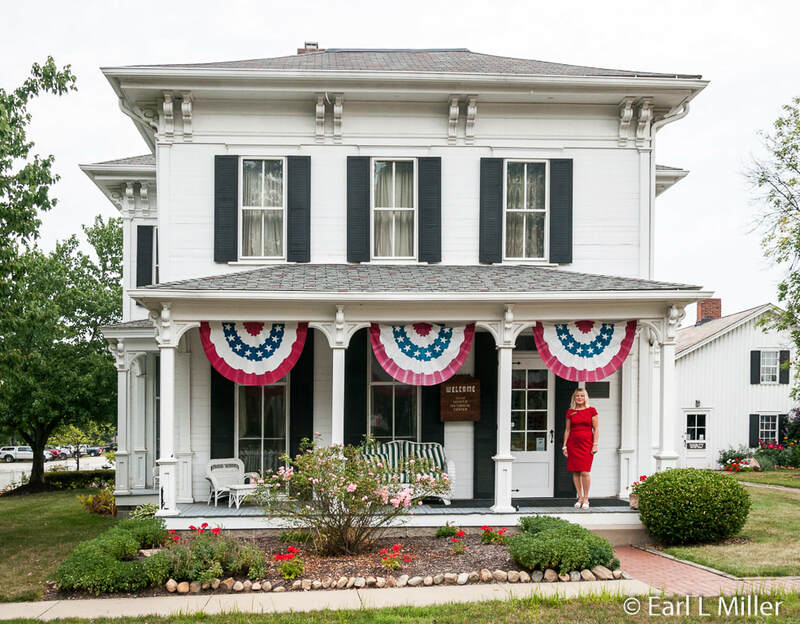 Located on Walsh University’s North Canton campus, visitors find the Hoover Historical Center. It opened in 1978 to showcase the vacuum cleaner industry created in this town. Today’s visitors tour the 1840's tannery building and the homestead, originally located 400 yards east of its current location. The Hoovers lived at the tannery until the farmhouse was built in 1853. 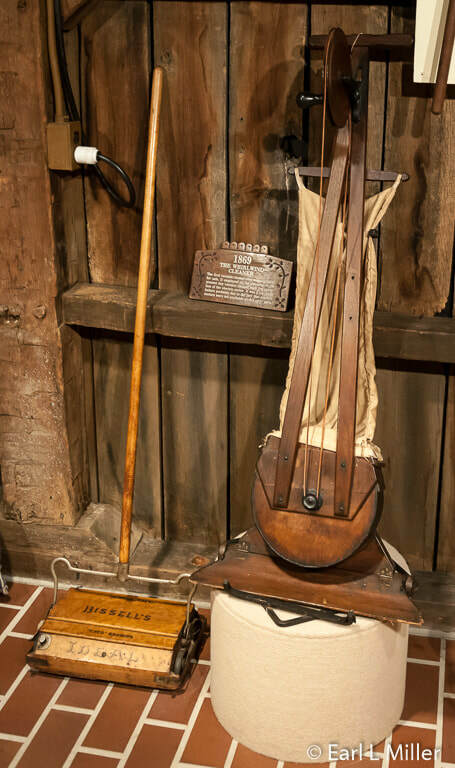 At the tannery, you’ll learn about Hoover family history and view early cleaning devices. 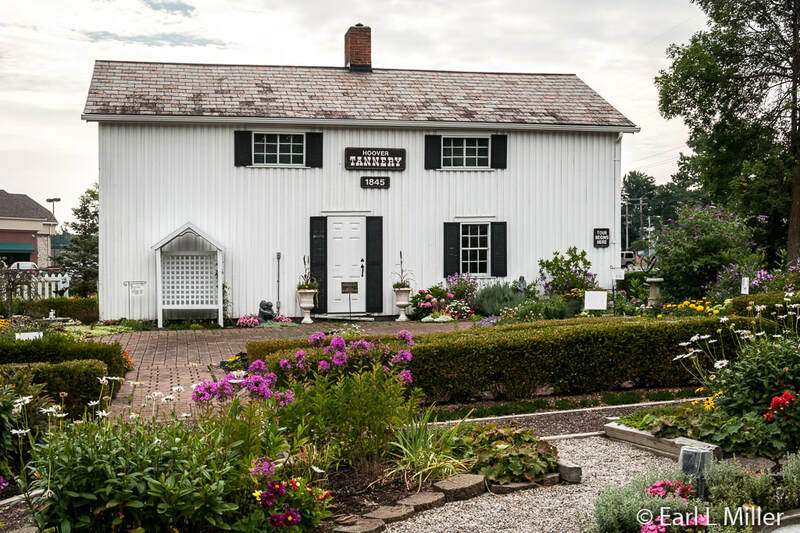 Before entering the tannery, stop and admire the beautiful gardens on the property. Developed by 35 volunteers, under the auspices of The Herb Society, they have become popular spots for prom and wedding photographs. 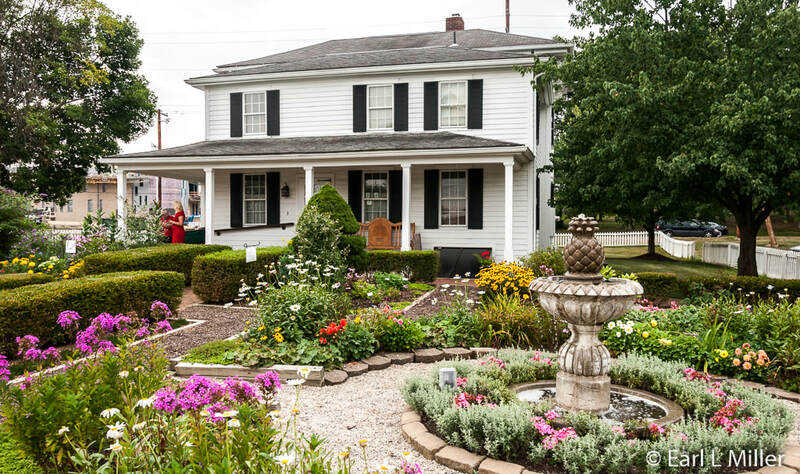 In 2016, these gardens won the Canton Garden Center’s beautification contest. They also won three awards from the Garden Club of Ohio. 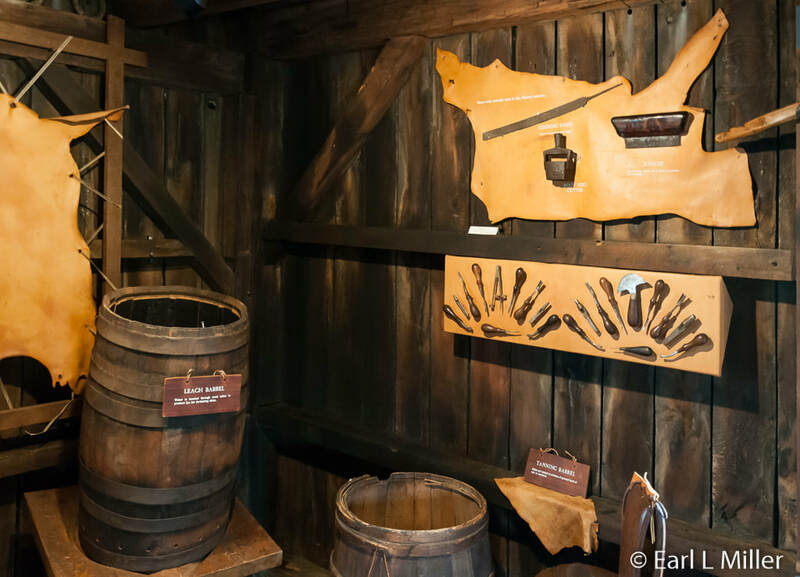 After the tannery, you’ll tour the 1853 homestead. It was expanded in 1870 with a Victorian Italianate style facade. 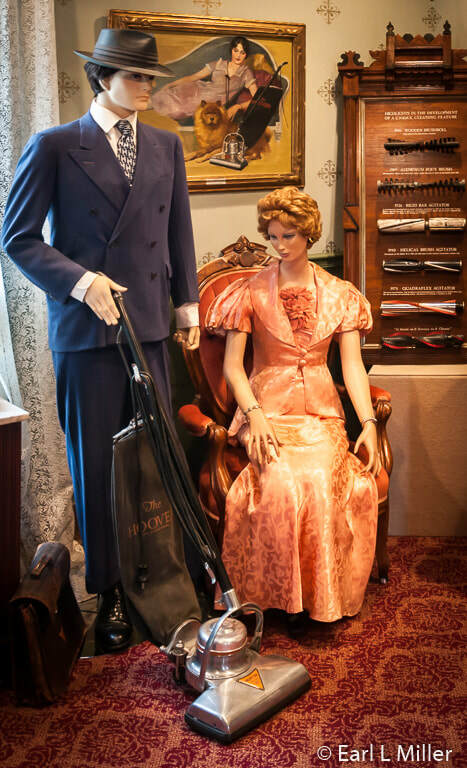 While visiting its two floors of exhibits, you will gain an understanding of how vacuum cleaners have progressed through the decades. You will also learn about the company’s extensive international history including its role in World War II. Original to the tannery is its wood siding, fireplace, and lots of windows. Its loft housed the bedrooms. 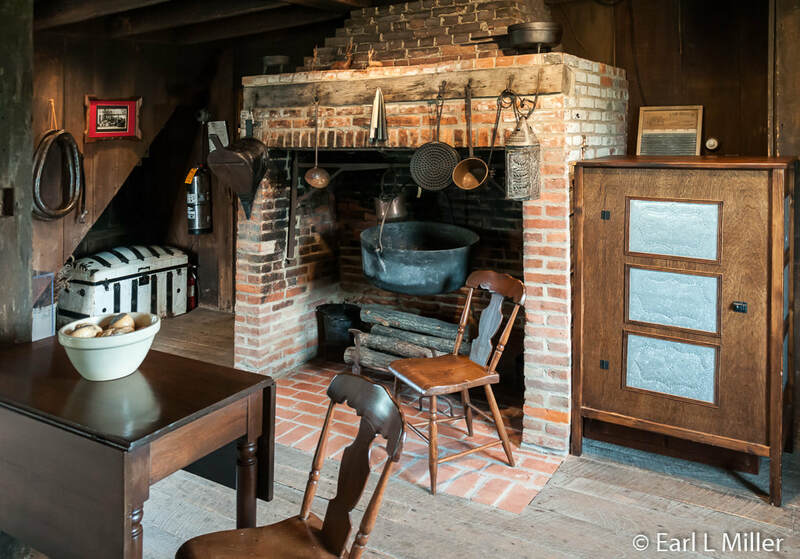 Cooking took place in the fireplace. On the wall, check out original tools, leather goods, and tanned skin. You will also see artifacts from the Civil War such as an entrenching tool and a Bowie knife. Hoover family history is extensive. Their name traces to Germany in the 15th century when they were known as “Hofer” which means farmer. It’s unclear when the name changed to Huber. However, in 1504, the Martin Huber family, migrated from Ravensburg, Germany to Canton of Basic, Switzerland. Between 1710 and 1724, their descendants, Johannes and Mary Huber, settled in Waynesboro, Pennsylvania and changed their name to Hoover. They were the parents of Henry Hoover II, who with his wife Margaretha and their eight children, including Daniel, arrived in Stark County, Ohio in 1827. Henry established a tannery in 1832. In 1845, at the age of 22, Daniel assumed his father’s business. He and his wife, Mary Polly, had three sons: William Henry, Joseph Warren, and Franklin Kryder. It was William Henry who in 1908 started producing electric suction sweepers. That business eventually became The Hoover Company. Education was very important to the Hoover family with all three sons graduating from college. Young Will attended Mount Union College in nearby Alliance, Ohio. Will, married in 1871 to Susan Troxel, planned to expand the tanning business to support his family of six children. In 1875, he acquired a building located two miles west of the farm and began making horse collars and leather straps for saddles. What made his horse collars different from his competitors was his “Perfection Collar” that lived up to its name. “Boss” Hoover refused to cut back on the quality of his goods and maintained that attitude throughout his business history. 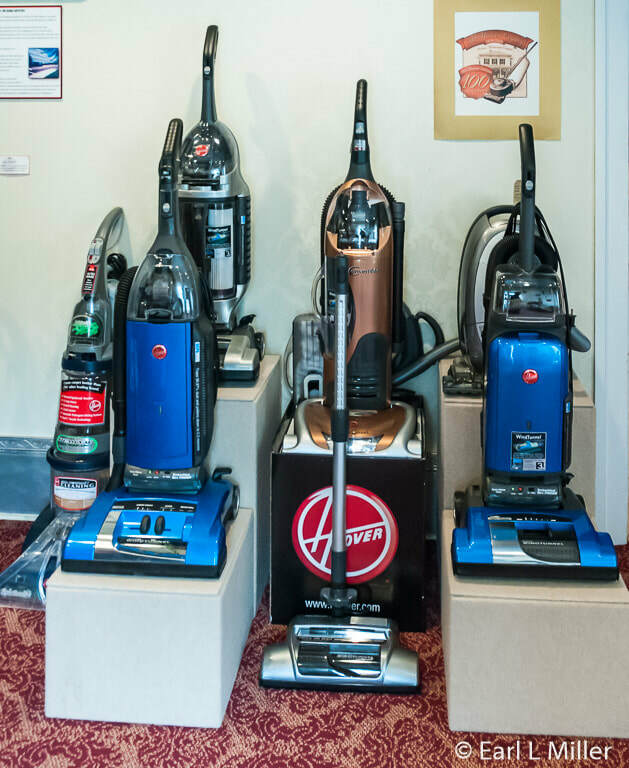 It was a value The Hoover Company continued throughout its manufacturing years. Hoover saw the horseless carriage was making an impact. To increase his business, he produced all types of leather goods for the automobile industry. These included leather straps for fan belts, license plate straps, and shock absorbers. He also expanded to sporting goods: leather jackets, vests, cartridge belts, and holsters. He was involved with several other endeavors. There were so many that it earned him the nickname “Boss” Hoover. He was an ordained lay minister, a member of the school board, and in 1905 elected the first mayor of New Berlin (later called North Canton.) He was a Sunday school teacher for 50 years and active on the International Committee of the YMCA. At the tannery, visitors view the evolution of cleaners dating between 1830 and 1913. None in this room were made by Hoover and all are manual. On view is an 1830 corn broom. The 1869 Whirlwind was the first non electric sweeper to use suction to pick up dirt. It had an attached bag. Because it wasn’t electric, it was not a marketing success. The 1870 Agan was the first to combine suction and a brush roll while the 1872 Willey was a carpet and floor duster. The 1876 Bissell carpet sweeper is also displayed. Manufactured in England in 1890, the Baby Daisy worked on a bellows action to create suction. It took two people to operate, Single-handed pump devices dated 1907, 1908, 1910, and 1913 are also exhibited. Visitors will enjoy the tannery’s interactives. They can operate bellows or use a replica of the 1910 Kotten which was operated with both feet. To operate it, you stand on both ends of the Kotten’s small teeter totter and balance. The faster you move to each end, the more suction is created. The first room is the home’s guest parlor. Furnishings are primarily period though the cabinet and melodian belonged to the Hoover family. You’ll spot photographs of the family and home throughout the house. Read signage for vacuum cleaners from 1900 through 1919 in this room. Spangler’s design used a motor from a sewing machine. He cut a hole in the sweeper’s back to which he attached fan blades. The blades blew the dirt from the cleaner’s rear into a pillow case that he used for a dust bag. He ran a leather belt from the motor shaft to the wooden cylinder brush roll. The sweeper had a tin box for the body and a wooden broom handle. In 1908, Hoover bought Spangler’s patent and founded the Electric Suction Sweeper Company. The Model “O” sweeper was made in the corner of the leather goods factory. Spangler, Hoover’s production supervisor, contributed new suction sweeper design patents until his death in 1915. On display in the room are a 1905 Skinner vacuum cleaner, a 1907 Spangler sweeper, and a 1908 Model “O” Hoover which had a wooden brush roll. In 1909, the wood was changed to an aluminum body brush. It was used until 1926. 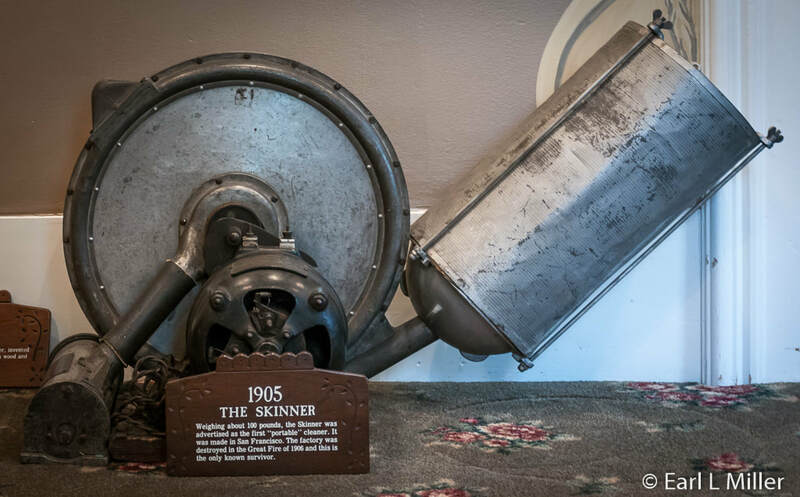 The 1905 Skinner, the first portable cleaner made, was manufactured at a San Francisco factory which was destroyed in the Great Fire of 1906. The one on display in this room is the only survivor. Starting in 1917, Hoover published “Newsy News” of which visitors will see a copy. It was printed at Hoover until 2005 by the public relations department. In 2005, a skeleton crew published two issues. “Boss” Hoover’s eldest son, H. W., was the company’s marketing genius. In 1908, he placed an ad in The Saturday Evening Post. It offered customers free use for 10 days of his vacuum cleaner to anyone who requested it. By using local dealerships to accomplish this task, he developed a national retail network for the vacuum cleaners. In 1909, Hoover established a research and development department providing Hoover with numerous patents and improved products that kept it an industry leader. The price tag of the Model “O” was $60 with an additional $15 for attachments that could be used on furnishings, curtains, etc. The company sold 372 Model “O”s by the end of December 1908. This was an exceptional number since only 10 percent of the population had electricity. 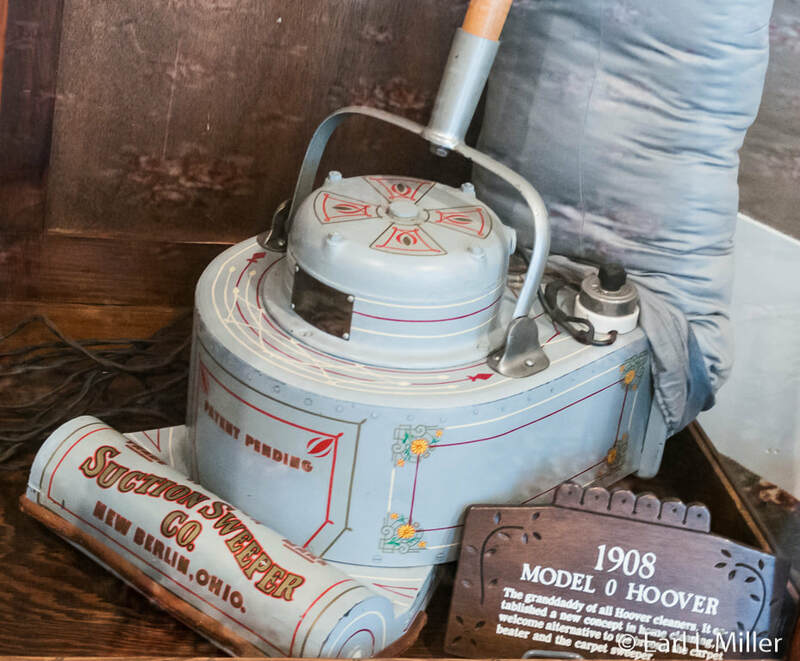 With more than 2,000 sold in 1909, Hoover became the manufacturer of the world’s first successfully produced, portable electric vacuum cleaner. In 1910, the company changed its name to The Hoover Suction Sweeper Company. The first international plants were in Windsor, Canada in 1911 and Hamilton, Canada in 1919. The first sales overseas were in England in 1919. Sales expanded to Australia, France, Germany, Holland, Ireland, and Switzerland during the 1920s. The only fireplace in the house is in this room. The clock and bellows are from the family. Ladies’ fashions complement the Hoover story. Visitors can accompany a recording of salesmen singing the Hoover melody. 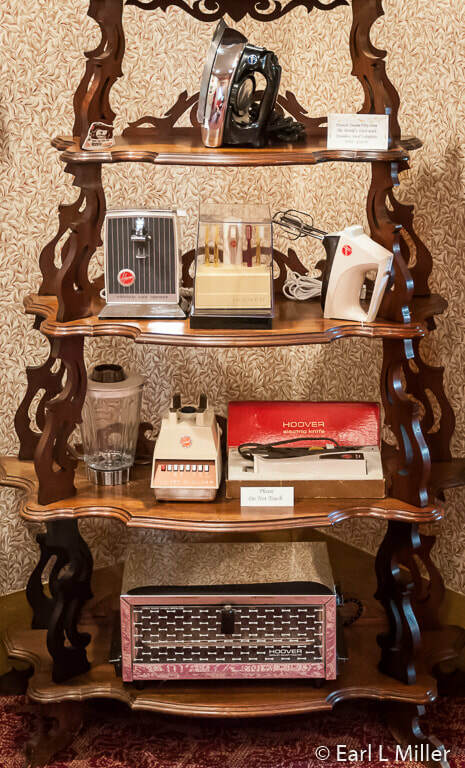 On display are examples of different Hoover products produced in the 1920s and 1930s. Look for signage on the history of brushes and about the company's 1932 international headquarters at Perivale, England (a London suburb) called Hoover Ltd. In 1922, H. W. Hoover succeeded his father as president and changed the company name to The Hoover Company. In 1923, the world’s first die cast, aluminum vacuum was pioneered. Between 1922 and 1924, improved belts, bags, and power cords appeared. There is information on North Canton’s famous landmark, the Hoover smokestack. It was built in 1920. It was torn down in 2015 for repairs and has since been reconstructed. You can see bricks from this structure in this room. It was 200 feet high with a diameter of 15 feet at the base and 10 feet at the top. In 1926, Hoover Model 700 acquired the first rigid bar agitator. It was a metal bar attached to a rotating brush roll that sat in the floor nozzle cavity of the upright vacuum. The beater bar alternated with the sweeping brushes to vibrate the carpet while sucking. It was used for almost 40 years and inspired the slogan “It beats as it sweeps as it cleans.” Model 700 also had the first pistol grip instead of a broom handle and the first switch to move from the top of the vacuum’s base to the handle. It also had the first rubber-covered cord instead of being made of cotton. In 1930, the company introduced its first handheld vacuum cleaner, the Hoover Dustette. Some are still in service today. That year, the company made toys as incentives to buy their vacuum cleaners. An optional headlamp, the Hoover Hedlite, was introduced in 1932 as a $5 option. The Hedlite was useful for dimly lit rooms and corridors and seeing under furniture since it illuminated the floor ahead of the vacuum cleaner. In 1933, the Hedlite was built into the Model 800 along with an “Aromadore” to scent the exhaust air. In 1936, Hoover introduced its top-of-the-line Model 150. It had several new features and sold from 1936 to 1939. It had an empty bag indicator, adjustable carpet height, a magnesium body which decreased its weight compared to other models, and a two-speed motor. Its patented converter simplified adding attachments. Its motor hood was made of Bakelite, one of the first plastics. 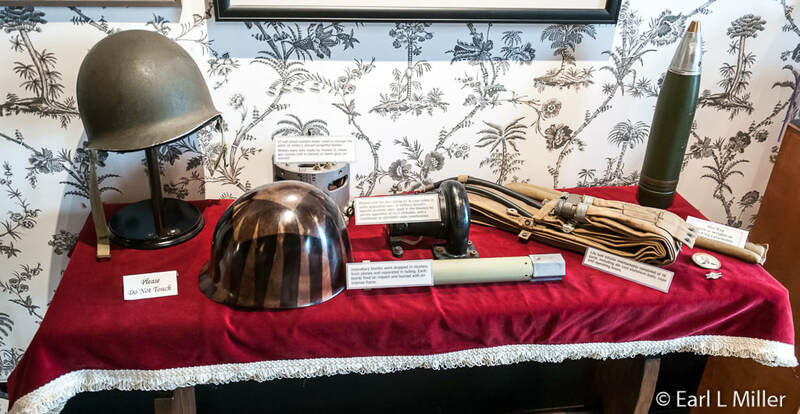 This room has displays on The Hoover Company’s involvement with World War II showing fuzes, incendiary bombs, and a light belt inflator mechanism. With World War II, The Hoover Company stopped making vacuum cleaners in 1942 and converted to the war effort. The company made a diversity of products. Their experience with Bakelite enabled them to produce plastic helmet liners and miner caps. Hoover also made propeller motors, life belt inflator mechanisms, air blowers used to cool radios, shot bags, incendiary bombs, and bomb parachutes. The company’s work on the highly secret variable time fuzes was considered second in importance only to the Manhattan Project in executing the war effort. Early in 1940, during the bombing of London, the Company made arrangements to evacuate 84 children of the employees of their Perivale, England plant to North Canton. The children were soon placed in suitable foster homes by the Family Service Society, the Children’s Bureau, and the Catholic Community League. The youngsters remained there until 1945. Hoover ran an advertising campaign emphasizing patriotism and support for the civilian war efforts. The company received many awards and citations including the Army-Navy “E” for its outstanding achievements during the war years. 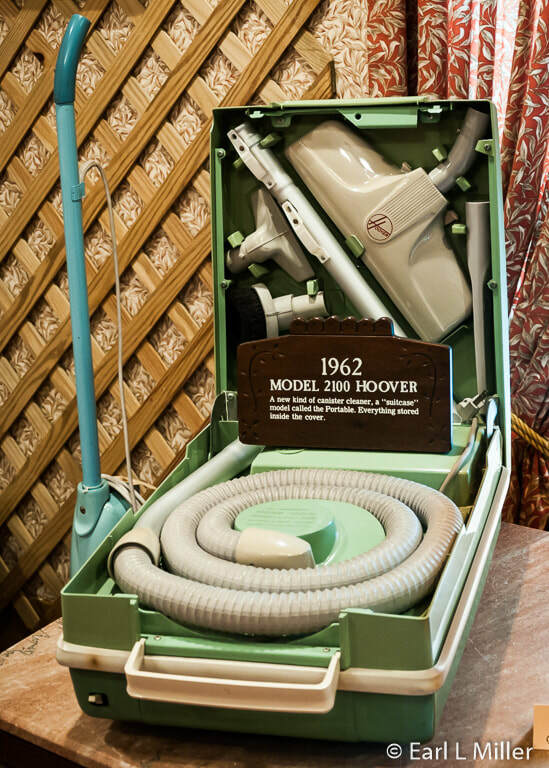 In 1947, Hoover manufactured their model 50. It was the first straight air, tank-type or cylinder cleaner that they produced. Additional post war technology included The Hoover Company’s entry into housewares in the United States with an iron in 1947 and a new factory in Wales to manufacture washing machines and dryers in 1948. One display consists of cartoons by Ellsworth Smith, a Hoover employee for four decades. After touring the downstairs exhibits, visitors head upstairs to the gift shop full of souvenirs, postcards and Hoover logo items. They’ll also find more Hoover advances in vacuum cleaner technology and history in two rooms. The first concentrates on the 1950's and 1960's while a second deal with the 1970's through 2008. An interactive involves turning on a round canister vacuum that runs on a cushion of air. In another room, they see demonstrated the power of a hand-held vacuum. The idea is to float a ping pong ball using a vacuum attached to a portable wall. During 1950, the Hoover red circle logo made its appearance and plant two was established in Canton. It produced fuzes for the Korean War effort. Hoover introduced the Veriflex, the first rubberized hose in the industry. 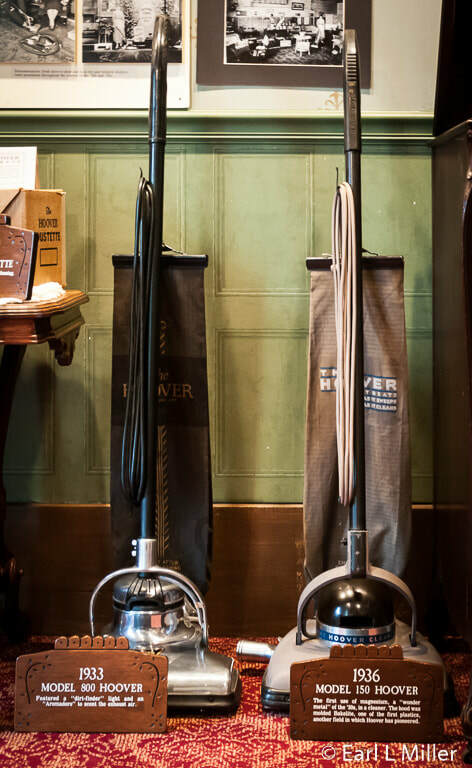 With the advancement of plastics, vacuum cleaners were now produced in a variety of colors and styles. Several updates to vacuum cleaners occurred during the 1950's. In 1953, the company introduced the disposable bag. In 1956, Hoover started building cannister vacuum cleaners called the Model 84 Constellation which floated on a cushion of air. It was made mobile by using its exhaust air to lift the cleaner from the floor and float it behind the user. During the following year, a plastic cover was added to cover the bags on the uprights. The Constellation was discontinued in the 1970's but reintroduced and sold again from 2006 to 2009. In 1957, Hoover produced the Model 65 convertible, their best seller for more than 30 years. It introduced a switch which automatically shifted the motor to a higher speed upon insertion of the tool converter. 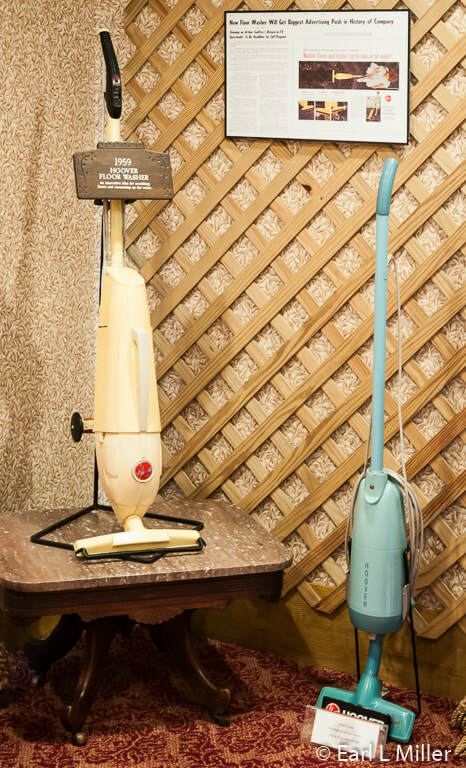 In 1959, Hoover made the world’s first floor washer and in 1961 their first stick cleaner. Global expansion continued during this decade with the construction of factories in Finland, France, and Mexico. Products diversified with more that included electric motors (made since 1919), commercial die castings, washing machines, and dryers. During the 1960's, expansion continued. Laundry units were made in North Canton. 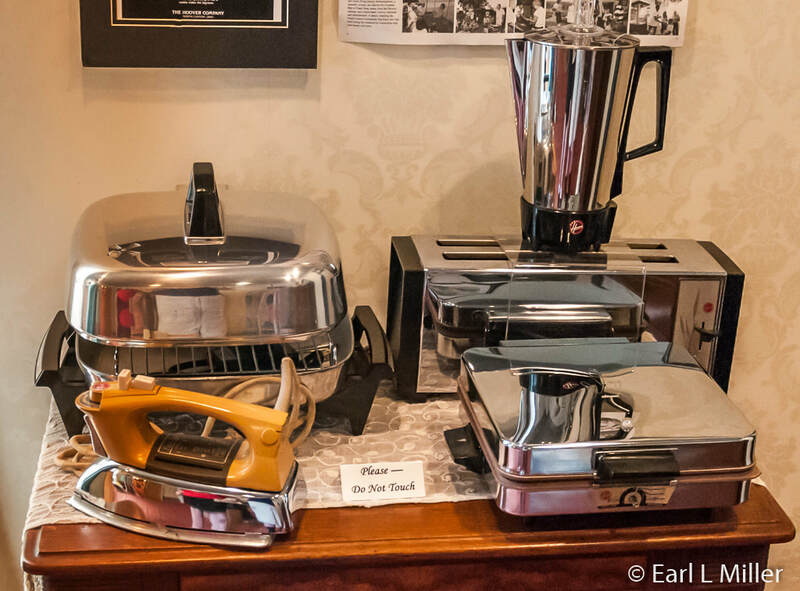 Small appliances such as fry pans, blenders, electric knives, toothbrushes, broilers, and toaster ovens were also manufactured. Some were made in Canton while others were outsourced. All wore the Hoover logo. The company stopped producing these at the end of the 1970's. The Dial-A-Matic was introduced in the United States in 1963. It was the first ever, clean air upright cleaner. It allowed air to pass through the dirt bag first, leaving only clean air to pass through the fan. The design was improved when they launched the Powerdrive self propulsion to drive the vacuum backwards and forwards by itself. Speed and direction were controlled by the hand grip. In 1978, the Quadraflex agitator, four brushes reinforced by beater bars, doubled the brushing and grooming action. It was used on Concept I cleaners. In 1994, Hoover entered the extractor category by introducing SteamVac™ followed in 2001 by the Floor Mate™, the world’s first floor care unit to vacuum, wash, and dry hard surface floors. The Wind Tunnel technology has revolutionized the vacuum cleaner. Its patented technology is more efficient. It's used on all Hoover uprights and canister power nozzles. It has an allergen-filtration system minimizing fine particles from escaping back into the air. Its two-ply disposable filter bag captures 100 percent of dust mites and 99.9 percent of ragweed and common grass pollens. It also has edge groomers. 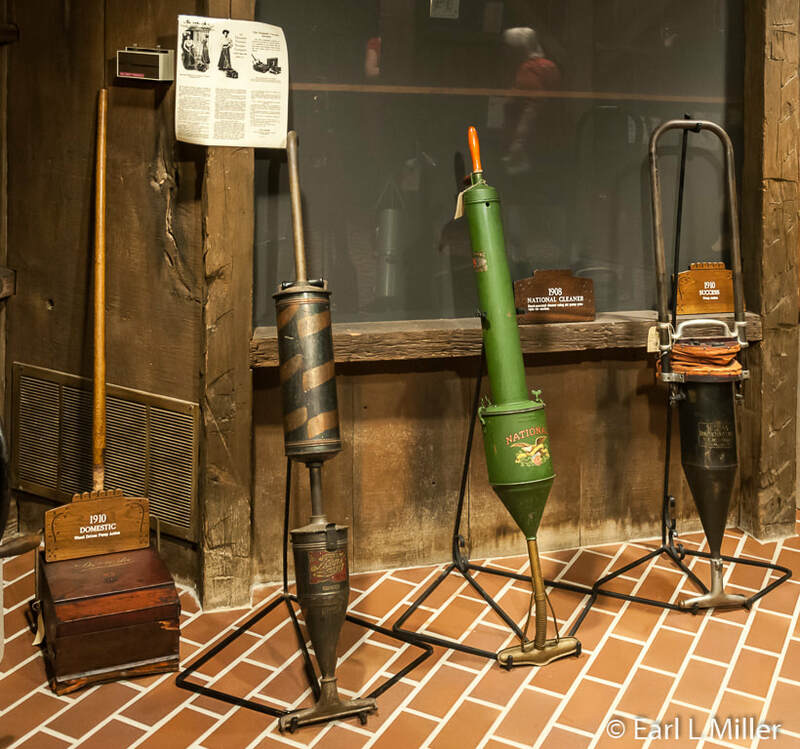 Beside vacuums, visitors discover photos of Hoover floats and awards they received from participating in the Pro Football Hall of Fame’s annual parade. In 1963, they hired people to build floats then did it in-house beginning in 1990. From 1992 to 1999, Hoover won the grand prize. From 2002-2005, Hoover was the major sponsor of the Hall of Fame Hoover Parade. In 1985, the family lost their control of Hoover when it was acquired by the Chicago Pacific Corporation of Chicago, Illinois. CPC merged with Maytag in 1989. That year, Hoover had 13 factories in 10 countries. Australia supplemented vacuum cleaners with the production and sales of laundry equipment. Other foreign factories produced refrigerators, dishwashers, and microwaves. Massive layoffs occurred in North Canton by the end of 2004 when Maytag consolidated Hoover headquarters. In March 2006, Whirlpool bought Maytag and sold Hoover to Hong Kong based Techtronic Industries Co. Ltd. In 2007, they established TTI North American headquarters in Glenwillow, Ohio. Although production of Hoover products ended in September 2007 in North Canton, TTI continues to assemble some vacuum cleaners under the Hoover logo in China and has moved some vacuum cleaner production to the states. The Hoover Historical Center, operated by Walsh University, is located at 1875 East Maple Street in North Canton. Their telephone number is (330) 490-7435. Tours are conducted hourly between 1:00-4:00 p.m. from Thursday and Saturday between March and October. Admission is free though donations are accepted. The Center opens exclusively for group tours by advance reservation. For more information on the Center and annual events, check out their site. 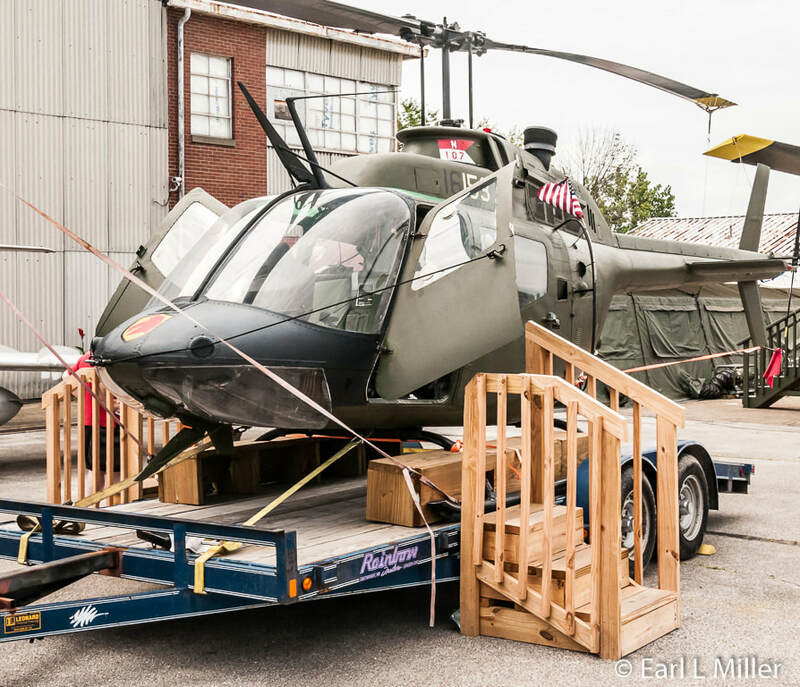 At a hanger, once property of the Ohio National Guard, visitors view restored aircraft, Gallery of Heroes displays, and two memorials. One is dedicated to Ohioans who died in Viet Nam. The other honors Ohioans who died in Iraq and Afghanistan. The building is on the west side of the Akron/Canton airport. MAPS was founded in 1990 with one airplane by 14 members from the local Ace of Spades Wing of the Confederate Air Force. Today, 47 planes are displayed and membership is more than 700. Many of the planes they’ve restored are on loan from the military. The organization has a threefold purpose. The first is to educate the public on the history of aviation and its impact on man. 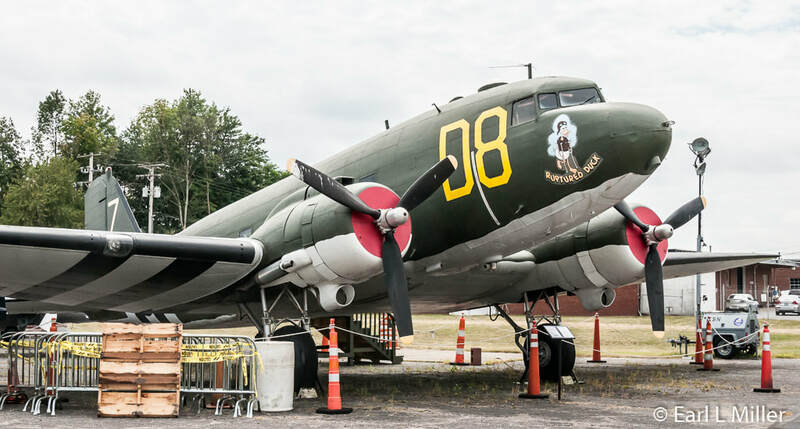 The second is to provide a place for retirees, who are either military or general aviation enthusiasts, to maintain their restoration skills. The third role is to honor veterans. They have programs for cub, boy, and girl scouts; summer camps; and an Air Academy ten week program for youngsters and their parents. They also conduct programs in United States history classes. 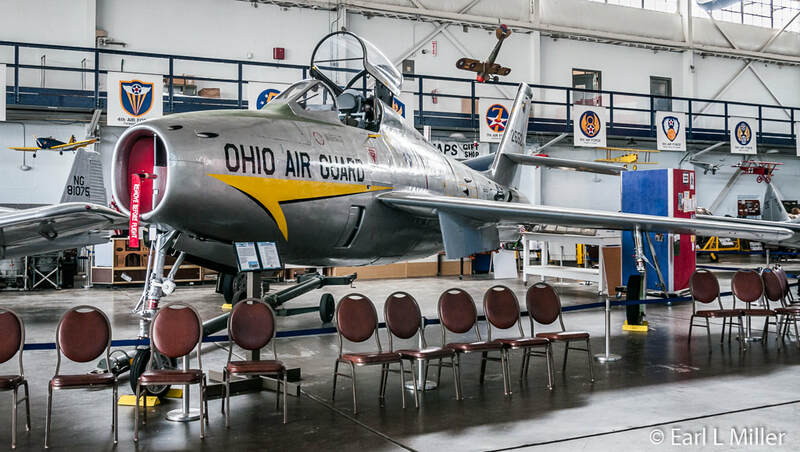 The F-84 Thunderstreak grabbed Earl’s attention since he worked on that airplane while a member of the Ohio Air National Guard in Mansfield, Ohio. 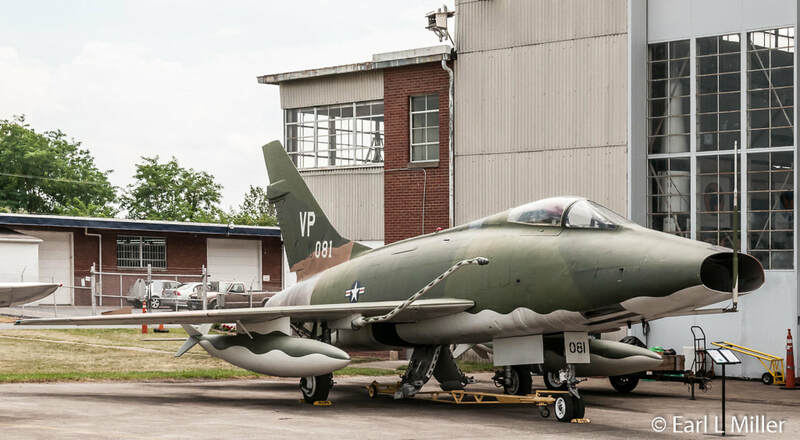 This turbojet fighter-bomber was used in Mansfield, Ohio in 1964 by the 164th Tactical Fighter Squadron but dropped from the inventory in 1972. It was one of the first aircraft the U. S. Air Force Thunderbirds used in their flight demonstration team. It did see limited combat use. Two names are written on its side. 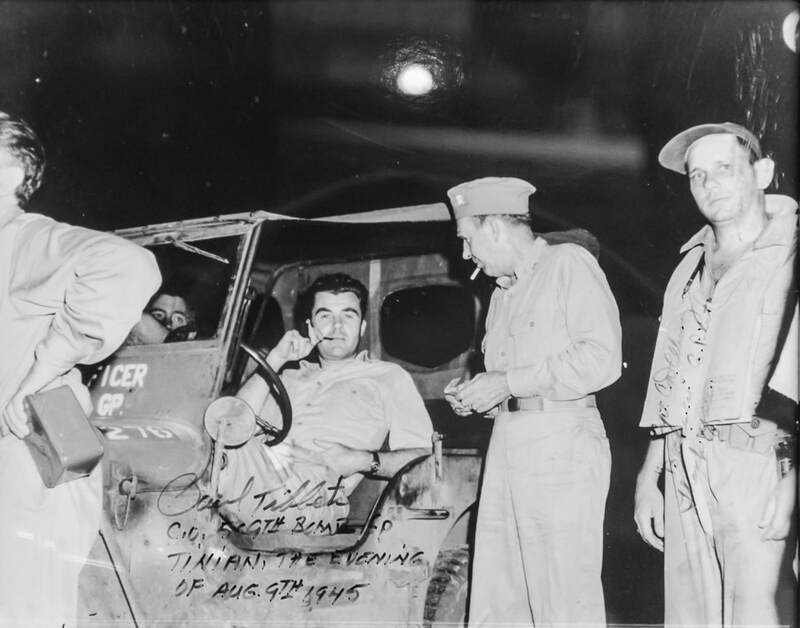 Staff Sergeant Paul R. Gates, the crew chief, and General Raymond D. Weber, the pilot on this plane. Both men helped restore it. The museum's oldest planes are a replica of a Sopwith Tri Wing from World War I and the Martin Glider built in 1908 by Canton native William H. Martin. He constructed one of the first mono wing designs in aviation. Martin’s wife, Almina, flew it on January 12, 1909 because she weighed less than he did. She was the first woman to fly any air machine in the world. The glider made 100 flights with power provided by everything from Billy, the horse, to a donated Ford automobile. Henry Ford and the Wright Brothers came to see it. For many years, it was at the Smithsonian parked next to Lindbergh’s Spirit of St. Louis. Their Blue Angels plane is a tribute to Stu Powie, an Akron resident. 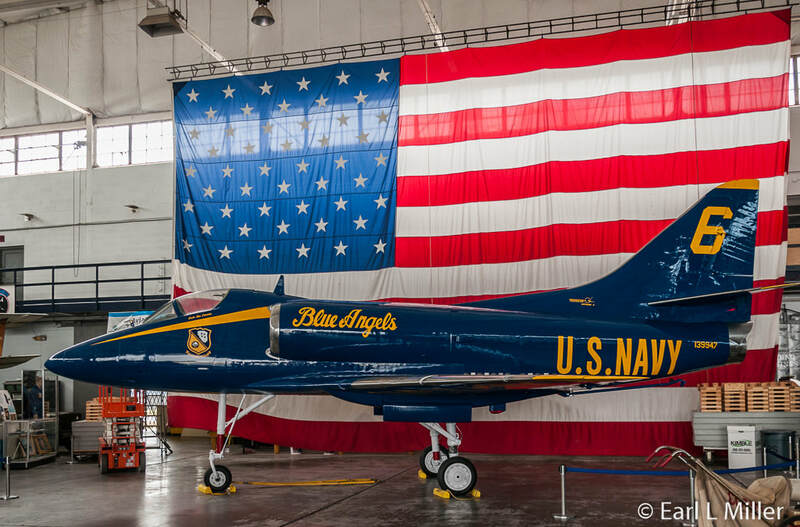 After serving in Viet Nam, Powie joined the Navy’s Blue Angels demonstration team in 1981. In 1982, he was flying this aircraft when it developed a problem. He tried a maneuver to correct the situation when something broke lose. The plane crashed and he lost his life. MAPS has one of six or seven remaining B-26 Martin Marauders in the world. One is now in France. One is flyable. The rest are being reconstructed. It was a World War II medium altitude bomber used most effectively on railroad depots, bridges, and airfields. It achieved an excellent reputation as a dam buster. MAPS has been working on reconstructing this plane for more than 20 years. It resembled a herringbone when they got it in 1994. Goodyear Aircraft built more than 4,000 Corsairs in World War II with Rosie the Riveter making one every eight minutes. The one at MAPS is number 99. It was at Goodyear before the company closed their headquarters' museum. When the company stopped building Corsairs, they made five seater Drakes and two seater Ducks in the late 1940's until 1953. These were amphibious aircraft. MAPS has the last remaining Drake. Parked inside is the Spirit of Akron’s gondola. It was designed by Goodyear but built by Loral when Goodyear withdrew from airship manufacturing. The gondola had a helium-filled envelope. When it crashed in 1999, the pilot and copilot sustained only minor injuries when the airship hit the trees. Two helicopters are on display outside. The Cobra, first flown in 1965, saw combat in Vietnam in 1967. It combined parts of the Huey with a streamlined fuselage carrying a gunner in front and pilot above and behind him. It had a wide range of armaments. 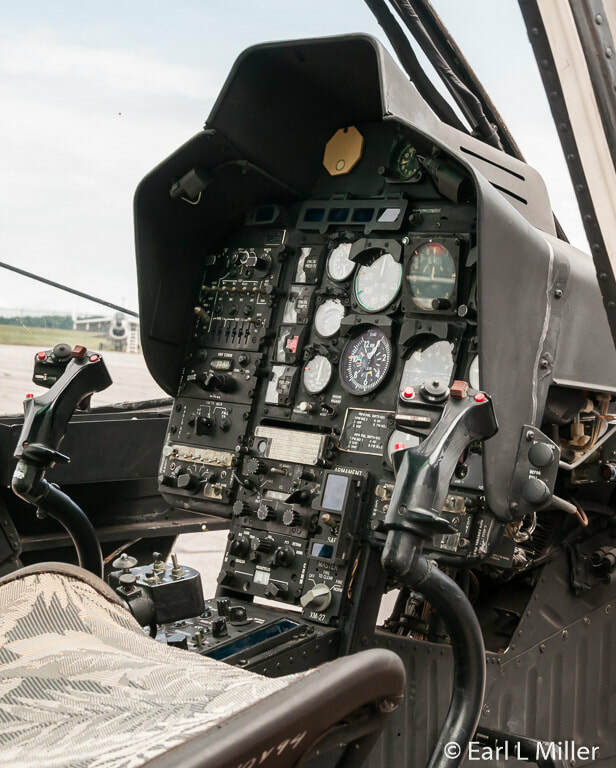 The OH 58 Kiowa was manufactured by Bell in 1968. It was a light observation helicopter used in reconnaissance. It was frequently paired with an Army attack aircraft in hunter/killer teams. The one on display served in the Gulf War. Visitors to the museum can enter and sit in these as well as a Russian MIG-17. Nearby, one can explore a MASH unit. Our guide advised us that MASH teams had nine hours to set up camp. If they didn’t succeed, it was torn down until they did it correctly. A C-47 Skytrain or Dakota, a military transport aircraft, was developed from a Douglas DC-3 airliner. It was used by the Allies during World War II and remained in front line operations through the 1950's with a few serving today. It transported troops, cargo, and the wounded. The SNB-5 Expeditor served all three branches of the military. It was a navigation trainer for the U.S. Army Air Force in 1943. In 1945, it transferred to four different naval bases. By 1952, it belonged to the Marines. The aircraft on view was primarily used for photo mapping. Their F-100 SuperSabre was the first Air Force fighter/interceptor aircraft capable of flying faster than the speed of sound in level flight. It also had the first supersonic capable autopilot . It flew mostly over South Vietnam as the Air Force’s primary close air support/ground attack (bombing) jet. It also saw service with several U.S. allies in their national air forces. The Gallery of Heroes has more than 60 displays. Most are artifacts from local individuals who served in the military or in an aviation field. In the upstairs portion of the hanger, plans are to show 65 displays of the Ohio Military Museum, formerly housed in Massillon, Ohio. “It will be a museum within a museum,” said Doug Perry, our guide. The gallery has some fascinating displays ranging from Rosie the Riveter, rationing, and Gold Star families to Tuskegee Airmen. It also has a piece from the battleship U.S. Arizona. A case is devoted to Benjamin O. Davis (1912-2002), the first African American to graduate from West Point. He became a four star general. One is on the Eagle Squadron, Americans who served in the Royal Air Force. Another concentrates on the Korean War. One case is on the women who served in the Air Force. They served as pilots yet weren’t officially recognized for being in the military until Jimmy Carter gave them that status. They died without military honors and had to pay their own way home after being deactivated. 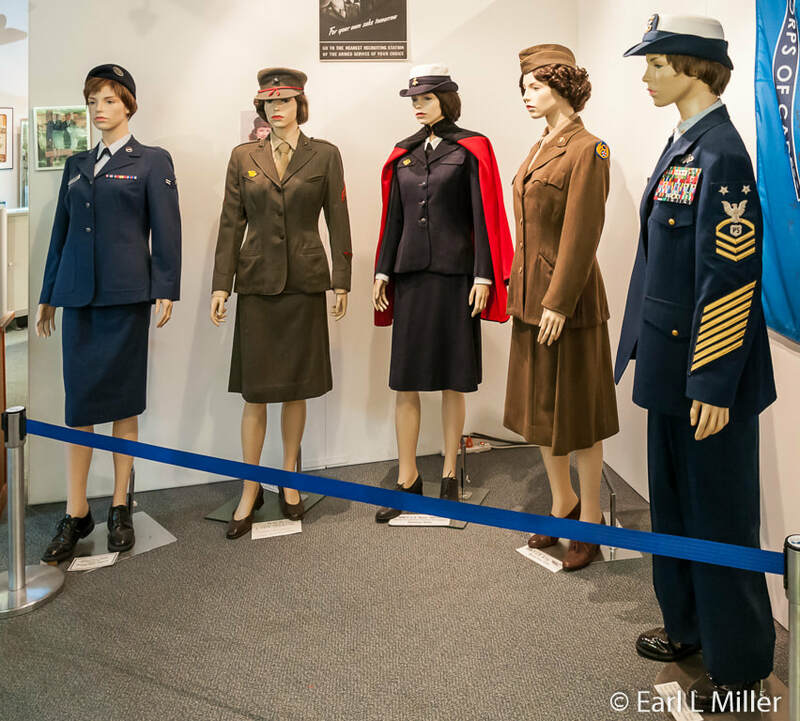 Different uniforms from such eras as World War II, Korea, and Desert Storm are exhibited. 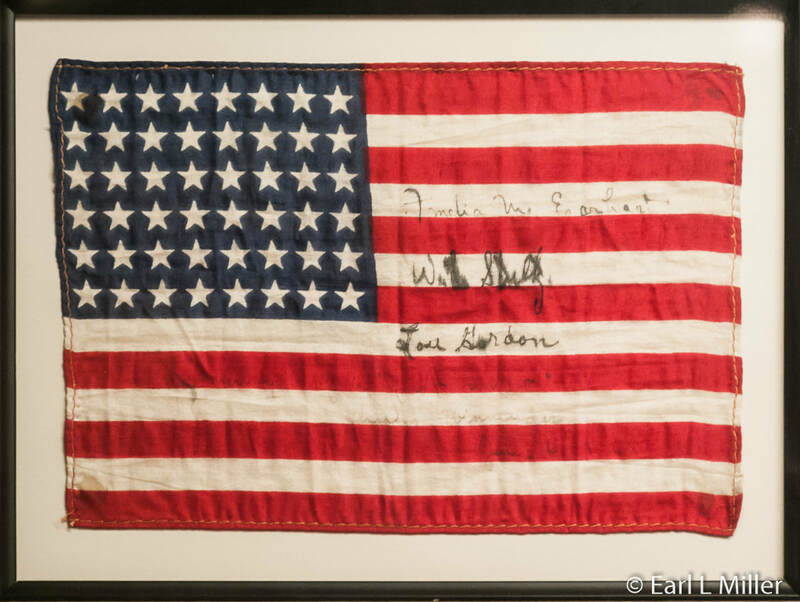 Highlights include a picture signed by the Enola Gay crew who dropped the atomic bomb and an American flag signed by Amelia Earhart. She carried it on her First Atlantic flight when she was a passenger. There are also letters home from American POWs. 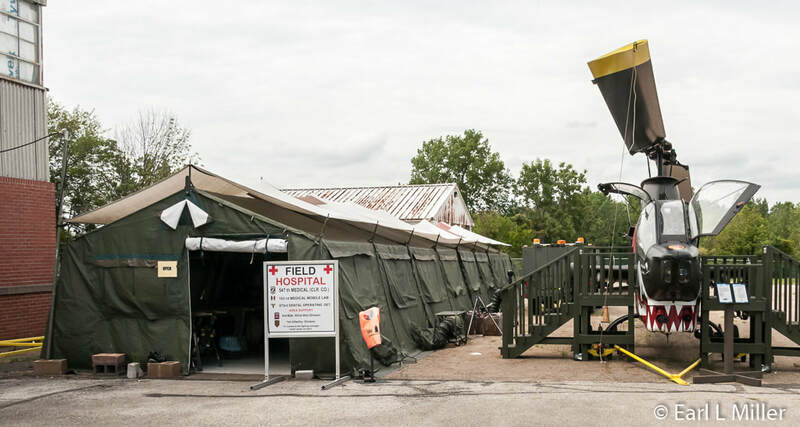 The Ohio Fallen Feather Memorial honors all Ohio warriors who died in Iraq and Afghanistan. It has three parts: Bald Eagle feathers carved in wood, the wall for mounting these feathers, and a book profiling the lives that were lost, Carvers were gathered from all over the state to produce a bald eagle’s feather that was individualized to each fallen hero. The feathers, on a memorial wall composed of Buckeye, the state tree, were all carved from Ohio wood. Each feather is in a 50-caliber shell casing containing a blood stripe, a red stripe from an American flag taken from a cemetery because it was not serviceable. An eagle, placed high and centered, faces the side with an olive branch symbolizing peace. On the war side, the eagle’s arrow side, it’s missing a feather since it was used as a template for the other feathers resting below. The eagle sheds a tear. MAPS is located at 2260 International Parkway in North Canton. Their telephone number is (330) 896-6332. Hours are Tuesday through Saturday from 9:00 a.m. to 4:00 p.m. and on Sunday from 11:30 a.m. to 4:00 p.m. Admission is $10 for adults, $9 for seniors (ages 60+) $6 for children, ages six to twelve, and free for under age six. Tours can be scheduled by calling MAPS. To learn more about their aircraft, visit their site. Remember! Anyone can sign up to be on the free notification list for new articles. Just fill out the contact form with name, city and state, and email. We never give out emails.